was age 20. His occupation was a Florist. John had been born to John and Hannah ( known as Annie ) Lowther in 1894, and was baptised on 17th December 1894 in the Parish of St Judes. 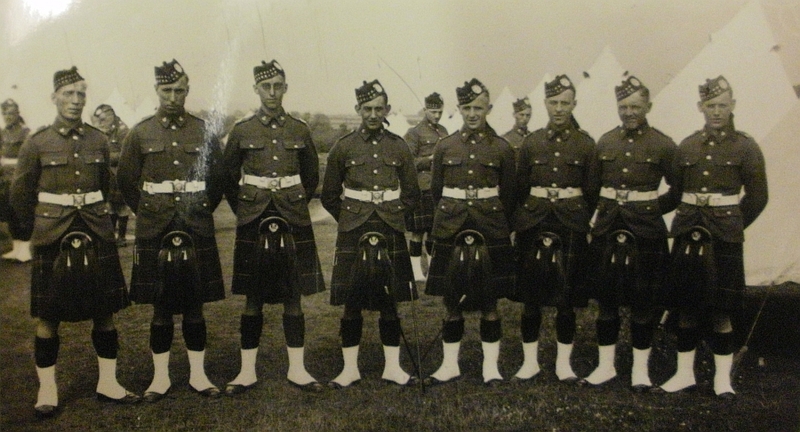 John Lowther ( 3rd from right front row ) and his Regiment before they were sent to fight. In 1916 he was re-called to the Army as they needed all the men they could get because of vast casualties. He re-joined the Kings Liverpool Regiment, and this time was in the 8th Battalion. As John was from Irish descent. His regimental number was now 307942. His theatre of war was France and Flanders. 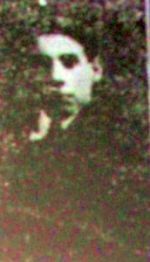 Sadly on 4th July 1917, while fighting on the Ypres Salient, John was hit by shrapnel in the area of his left shoulder and died from his wounds, he was just 22. He is buried at Lijssenthoek Military Cemetery in Belgium. John was awarded 2 medals, the Victory and the British. His attestation papers for when he signed up with the 13th King's Liverpool in December 1914 give his age as 20, but all records for John after this list his age at death as 28, when in fact he was aged just 22. Submitted by his Niece Ann Wright. Private David Mackie 49565, The King's (Liverpool Regiment) 20th Bn. Killed in action 09/04/1917, aged about 22. He was the son of James and Annie who where both born in Scotland. David was wounded in action in February 1915 and returned to England. He went back to France at Christmas 1916. He lived at 7 Louis street and his parents at 1 Steele street, Athol street. David was employed before the war by Messrs Bibby's Oil Cake Mills, Great Howard Street. David is buried at Henin Crucifix Cemetery in France, and remembered on the war memorial at St Anthony's church, Scotland road. My Uncle John Newland Maffitt was born 1895 in Bootle. He went to sea with the Cunard Line and at one time during WW1 he was serving aboard the HMS MEDUSA ( Medusa is the name on his cap in the photo to the left ) The HMS Medusa served as a destroyer and was sunk on 25th March 1916 when it Collided with British destroyer Laverock off the Danish coast whilst under attack by German aircraft. She had been screening the seaplane carrier Vindictive on a raid. Everyone onboard was taken off before it sank. Nothing else is known about John's service, he was probably transporting supplies to troops abroad and back to Britain. In August 1918 he was serving as a boatswain aboard the Liverpool registered ship MONMOUTH, they were in the Gironde Estuary, Southwestern France, when John fell ill. The ship docked on 24th August and John was taken to hospital in Pauillac, records show he was also discharged from service on this day so did they know just how ill he was? Sadly 3 days later on 27th August John passed away from from acute bronchitis. His last known address was given as 15 Latham Street, Liverpool. 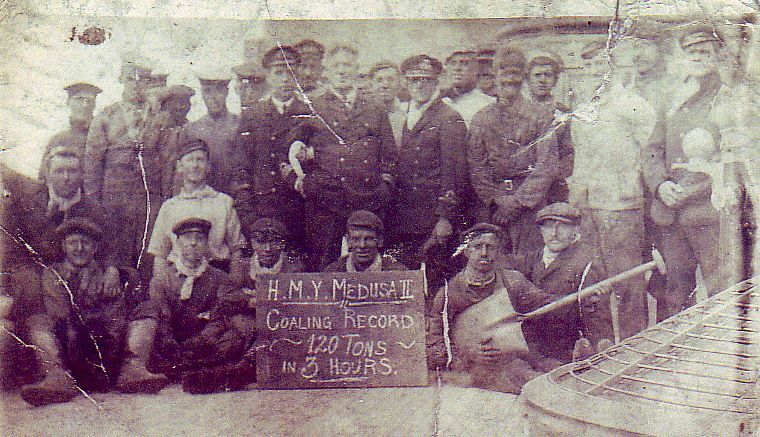 The Coalmen showing their record for moving 120 tons of coal in 3 hours onto the Medusa. The man sitting behind the board is Charles Maffitt, brother of John. The family has always believed that they are related to the famous naval officer Capt John Newland Maffitt that of the Navy of the Confederate States of America. It is thought that when he was back and forth from the US to Liverpool,(cotton) he may have fathered a child in Liverpool. Charles Sherlock Maffit married Mary Jane Parry, and he just upped and left her,nothing could be found what happened to him,the name of his father was John Sherlock Maffitt, a master mariner. Mary Jane Parry's father was Capt James Parry. It would explain why John received his name. Submitted by his Nephew Arthur Clake and Ann Rowlands. In 1913, a year before the Great War was declared, George volunteered for the Lancashire Hussars Yeomanry, a territorial army unit. He had a liking for horses, so it made sense for him to join a cavalry unit. At the beginning of the conflict in early August 1914, he was in training camps at Rufford Park and Kirkby Lonsdale, Lancashire. A year later, George was issued with a bicycle instead of a horse. The substitution was due to the grievous slaughter of horses on the Western Front during the opening year of the war. In 1916, George transferred to a regular infantry regiment, the Lancashire Fusiliers, again as a private. In that year, he was in the Lancs Fusiliers’ 12th battalion as part of the British–French Expeditionary Force shipped out to Greece. The Fusiliers were part of the British Army’s 22nd Division, 65th Brigade, based in Salonika, present-day Thessalonika, the capital of the Greek province of Macedonia. As did so many other Allied troops serving on the Macedonian front, George contracted malaria, symptoms of which would recur later in life, as is characteristic of this mosquito-borne disease. Malaria proved to be a serious drain on manpower on the Allied effort during the Salonika campaign. British forces suffered 162,517 cases of the disease and a total of 505,024 non-battle casualties. Because the Salonika front was given low priority by the War Office, the assistance rendered by voluntary medical organisations, such as the Scottish Women’s Hospitals, proved invaluable. George remained in Greece from September 19, 1916 to January 25, 1919. Meanwhile, he transferred from the Lancs Fusiliers to the Western Command Labour Company (WCLC) Labour Corps on March 12, 1918. At discharge exactly a year later, his character was deemed to be “Very Good” and he received a pension. When the Second World War broke out, he was appointed a sergeant in the Home Guard. In peacetime, he rose to become an area manager in the British Post Office telephones. George lived until age 94, and died in Liverpool on January 18, 1987 of old age and emphysema. Patrick was born in Dublin in February 1894. He grew up in the city and later found employment on the Dublin docks. In 1915 he signed up for duty with the Royal Dublin Fusiliers as private 8464, seeing action in the Balkans with his regiment. Patrick deserts his regiment in January 1917 and makes the trip across the Irish sea to Liverpool, and just five weeks after deserting the RDF he enlisted as 202839 with the Liverpool Kings regiment. However to cover up his true identity he joins under the alias of James Conway, and gives his address as Liverpool. Patrick was in France by March 1917 and saw action both there and in Belgium. 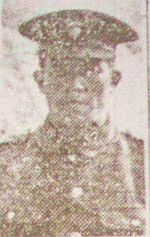 On 21st September 1917 his regiment went into the trenches at Torreken Farm, and came under heavey shell fire from the enemy, sadly the following day Patrick was to lose his life. He is buried at Torreken Farm Cemetery Number 1, Belgium, and also remembered on St Anthony's war memorial in Scotland road. It would seen that Patrick had family in Liverpool and stayed with them for the few weeks before he enlisted with the Liverpool Kings, after the war they would add his name to the memorial at St Anthony's. Edward was born on 19th October 1918 at O’Donovan Terrace, Hook Street, Scotland Road, Liverpool to Joseph and Julia McCaffrey. He was a pupil at St. Sylvester’s school, and on his leaving education he joined the Merchant Navy. Edward was engaged to his Sweetheart, and they planned to marry on his return from war service. 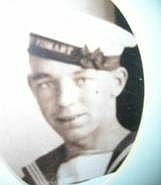 In 1944 Edward was serving aboard the S.S. Wayfarer. The ship had left Port Said, Egypt for the Uk carrying a cargo of Copper. On the evening of 19 August 1944 the Wayfarer was spotted by U-Boat 862 who began to torpedo the ship. Wayfarer's Master John Wales sent the ship into Zig Zag motions, and managed to avoid the oncoming fire. They managed to escape, but the U-boat still had them in his sights. 90 minutes later Heinrich Timm commander of U-Boat 862 spotted the Wayfarer and again fired upon her. There was no chance of escape, and she recieved a fatal hit to her Port side. S.S Wayfarer sank 90 miles off the coast of Mozambique. Sadly Edward lost his life during the sinking. The total losses included the Master John Wales, 44 Crew members, 5 Gunners, and 1 Passenger. 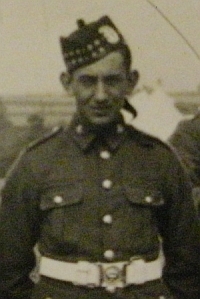 Private Hugh McCaffery 41606, The King's (Liverpool Regiment) 17th Bn. Killed in action 01/08/1917. He lived at 253 Burlington street with his wife and two children, and was a member of St Bridget's congregation. Hugh is buried at Zantvoorde British Cemetery in Belgium, and remembered on the war memorial at St Anthony's church, Scotland road. At the time of the May Blitz in 1941, I was 4 years old and living with my mother Becky who was 33 and her two teenage sisters Edna and Jean. Although I have no memory of what took place then, I have been told about it many times by my mother and my aunts. We were living in Ariel St., Kirkdale, a cul-de-sac off St. Johns Rd., backing on to the Liverpool - Southport railway line. On Saturday May 3'rd during the air-raid we were as usual under the table. A landmine fell somewhere near the house, but apparently did not explode, though the windows were broken. Soon an Air Raid Warden knocked and called out 'Is anybody there?'. Becky answered 'A woman and three children'. He told her that we had to get out quickly because of the landmine at the back. He took us to St John's Rd. from where we went up to Stanley Rd., across Bankhall bridge and along to Daisy St. School. We were walking across the school playground when the ammunition ship blew up with a terrible noise. This was the 'SS Malakand' in the Huskisson dock. My mother then decided to try to get a lift to Crosby, where she worked as manageress of the Scotts Bakers shop in Endbutt Lane, to which she had the keys. We went up to Stanley Rd. The first lorry which came along stopped. By an extraordinary stroke of luck, the driver was Becky's elder brother John, who worked for Jarvis Robinson. He took us into the cab, and we drove off. On the back of the lorry were a lot of people whom he dropped off all around Maghull. John then took us to Crosby, and we stayed in the shop till the morning. My mother later rented a small terrace house near the top of Endbutt Lane and my aunts were soon working at Littlewoods making ammunition. Tom McIntosh has the honour of taking Middlesboro to their highest ever league position, third in the 1913-14 season. 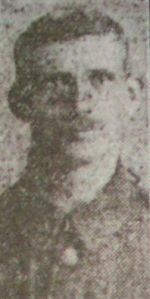 McIntosh's spell as manager was interrupted by WWI after only two seasons, he returned after the war for a short while before a move to Everton. At Everton he was most famous for spotting and signing Dixie Dean. Under McIntosh's guidance Everton won the FA Cup and Football League Championship. He died from cancer in October 1935, and was eventually replaced as secretary manager at Everton by Theo Kelly. Tom Joined the 12th Service Battalion of the Yorkshire Regiment, Known as The Teeside Pioneers. Before long he was promoted to company Quarter Master Sergeant. In January 1916 Tom,s company landed in France. He later recieve his commission becoming a 2nd Lieutenant and was mentioned in despatches twice. When you Blues go the match and see Dixie's statue remember it was good old Tom Mcintosh who signed him for you. Private John McKenna 40187, The Loyal North Lancashire Regiment, 2nd Bn. Formerly 30959 Manchester Regiment. Killed in action 01/08/1918. Son of Mrs. E. McKenna, of 41, Epsom St. John is buried at Raperie British Cemetery, Villemontoire in France, and remembered on the war memorial at St Anthony's church, Scotland road. John enlisted in Liverpool on 11 October 1915, then on 15 October 1915 he joins the 1st Garrison Battalion Manchester regiment at Knowsley with the service number of 30959. He gives his age on enlistment as 20 years and 7 days, is 5 feet 3 1/4 inches tall, weighs 112 pounds and has a chest measurement of 36 inches. His physical development is listed as good and his trade is a Labourer. Now John's records show he was a bit of a lad and was not much bothered about army life. I have to admire him as it looks like he was going to do the war his own way. He trained in Knowsley and on 2 March 1916 he is awarded 14 days confined to barracks and fined 8 days pay for being absent without leave from 20 February to 28 February 1916, thereby being absent from his regiment when they proceeded overseas. During his absense he is transfered to the 2nd Garrison Battallion Manchester regiment. John stays in Knowsley but has no intention of changing his ways and is again in trouble on 26 April 1916 when he is charged with being absent from 22 April to 25 April 1916 and fined 3 days pay along with 14 days field punishment number 2. On 13 June 1916 John is arrested in Liverpool by Greater Manchester Police for being absent without leave. He is also charged with being drunk in Lord Nelson street at 10.40 pm, disobeying an officer and for being in Liverpool without a pass. He is given 14 days detention. John is then posted to Aintree racecourse in Liverpool, maybe in the hope of changing his ways or maybe Knowsley had had enough of him. He is then charge with being asleep at his post at 4.am on 13 July 1916 and awarded 18 days detention. Then on 26 August 1916 he goes absent without leave before being apprhended by the Liverpool police at 10.10 am on 6 September 1916, John is given 168 hours detention and fined 11 days pay. John is given 7 days confined to barracks for going absent from 23 to 24 September 1916, then amazingly his is confined for 3 days extra on 26 September 1916 for shaving his upper lip ( moustache ) contary to regulations, before being confined for another 7 days on 17 November 1916 for absence from guard mounting parade. By the 28 November 1916 the Manchester Regiment have had enough of John and he is transfered to the 6th Garrison Battalion Royal Welsh Fusiliers under the service number of 62569. 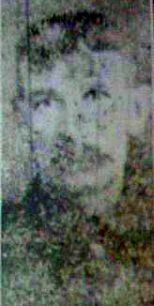 He is still in Aintree and is charged on 11 December 1916 with being in Liverpool without a pass, also added is a charge dating back to 19 September 1916 for disobeying Mersey defence order Number 8. John is confined to barracks for 7 days. On 24 January 1917 he sails from Devonport, arriving in Port Said, Egypt on 23 February 1917. On 2 August 1917 John is transfered to The Loyal North Lancashire Regiment, 2nd Bn. service number 40187. He is at Alexandria on 12 August 1917. He is charged on 7 September 1917 with having a dirty rifle on guard mounting parade and given two extra guard duties. It looks like the army was determined to change John as his list of offences starts to get very petty, on 4 October 1917 he is given 3 days confined for having long hair yet is awarded professional pay on 11 Otober 1917. 29 January 1918 he is awarded 5 days confined for eating the biscuits of his ration without permision, Then 4 days confined on 7 February 1918 for being improperly dressed on 9.15 am parade and not having his sheet rolled up. On 25 March 1918 his is given 1 day confined for having a dirty canteen on company parade at 1400 hours. John leaves Egypt from Port Said on 18 May 1918 sailing to France he arrives in Marseilles on 27 May 1918. Sadly John is killed in action on 1 August 1918. You can make whatever of John's war record, I think fair play to him as he chose to live his life as he saw fit, he made sure he had some fun during all this madness. He died fighting for his country and is one of the most interesting men I have researched. They talk of heroes, well in my book John and all the other service people became heroes when they signed their enlistment papers. 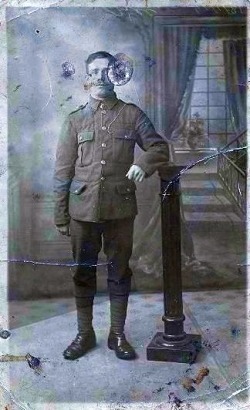 Private James McNamara 11000, The King's (Liverpool Regiment), 4th Bn. Killed in action 20/05/1915. James had served 12 years with the 1st battalion of the King's Liverpool regiment, and had fought all through the South African campaign where he was awarded the D.C.M. On 21st August 1900 he was on patrol with his mounted infantry when they where attacked by many Boers. One of their party was wounded and Private McNamara and another comrade turned back and suceeded in bringing him back safely. James left a wife and two children. He is remembered on the Le Touret Memorial in France, and on the war memorial at Our Lady of Reconciliation church, Eldon street. William is buried at Delville Wood Cemetery, Longueval in France, and remembered on the war memorial at St Anthony's church, Scotland road. Christopher Medland was born on the 8th August 1905 in Liverpool to John James and Catherine Ann Medland. Christopher first served in The Merchant Navy in 1922. In 1929 during the Great Depression Christopher found himself berthed in North America. He was unable to sign on a ship to get home to the United Kingdom due to the fact that there were very few positions vacant because of the depression. He worked for the Ford Motor Company for two years during which time he sent money home to his family. On 24th May 1933 he married Emily Greenwood at St Philemon's Church, Toxteth, Liverpool. Emily's first husband was Arthur (James) Greenwood. He was a rigger at Cammell Lairds, Ship Builders, Birkenhead. He fell to his death. (date not known) They had one son Arthur James Greenwood - step brother to Christopher and Emily's four children. Emily's maiden name was Owen. Christopher and Emily first lived in Gwendoline Street. Their first child Jean Irene was born there. They then moved to 6, Emerald Street, The Dingle, Liverpool. Christopher's sister Annie also lived here. At a later date Christopher, Emily, Jean Irene and Arthur James moved to 12, Violet Street, Toxteth, Liverpool 8. (Just off Windsor Street and Warwick Street) Christopher, David and Carol were all born in Violet Street. During this period Christopher was at sea and the children were conceived when he was on shore leave between voyages. He signed on with many different Shipping Lines during his service with the Merchant Navy and went all over the world including South America, the West Indies, Africa and all points of the compass. When Christopher was sailing on a ship named the Chagres, it collided with a Swedish barque named the C.B.Peterson which sank. Then came World War 2 in 1939. Christopher was still in the Mercahant Navy and because of the threat of marauding U-boats the convoy system was organised in the hope that this would mean less merchant ships would be sunk - safety in numbers !! At this time Christopher was a fireman / donkeyman in the engine rooms of the ships he sailed in. While Christopher was sailing with the convoys the Luftwaffe were bombing Liverpool on a regular basis as it was the the main port on the West Coast for the convoys to berth when they returned from Canada and America. Emily and the family at home had to cope with these conditions as well as the added worry of whether Christopher was safe. During this time Windsor Street about 200 yards from Violet Street was bombed. The Luftwaffe had missed the docks and jettisoned the bombs killing and injuring many people. The Medland family were lucky !!. In 1942 when the German U-boat wolf packs were at their height, a convoy Christopher’s ship was part of, was returning from America when the convoy Commodore ordered them to scatter. The ship Christopher was on thought they had been torpedoed after a loud crashing sound. The ship though damaged at the bow was not sinking as she was still seaworthy. They carried on to Liverpool. When the ship arrived in Mersey Bay waiting to dock a small ship arrived and she was escorted to the dock. On the dockside stood an Admiral of the Royal Navy waiting to meet the Captain and crew. After the order to scatter had been given, the ship had actually collided with a partly submerged U-boat and sunk it. Christopher was declared unfit for further service on 19th December 1942. During his service as a Merchant Seaman he led an interesting life and experienced many happy and sad episodes over the years. After leaving the Merchant Navy Christopher worked on a dredger at Garston docks in Liverpool. In 1953 he applied for a job at ICI in Northwich Cheshire. At that time ICI had an agreement with the local council to allocate council houses to new ICI employees. He was allocated a house in Barnton. (a small village on the outskirts of Northwich) Consequently the family moved to Northwich. He first worked in the boiler rooms which generated the power for the ICI factories at Winnington and Wallerscote. At a later date a vacancy occured for deck hand and cook on the MV Polythene - a coaster belonging to ICI. The Polythene travelled up the River Weaver to Runcorn then through the River Mersey to Glasgow and then returned to Northwich. This journey was undertaken on a weekly basis. Christopher continued in this occupation for a few years until he had a bad heart attack. When he was fully recovered ICI gave him a job in the mail room of their Northwich office. Christopher retired from ICI and then went to work at the Westminster Bank in Northwich as a customer usher. Christopher Medland passed away on the 17th January 1982. His wife Emily passed away on the 13th March 1999. This is the story of the life of a man who sailed the world from 1922 until 1942 when he was no longer considered fit enough to be sailing the seven seas. He served his country during World War 2 by sailing in the Atlantic convoys. He was awarded the following medals The 1939 - 1945 Star, The Atlantic Star and the World War 11 Medal. He worked hard all his life and cared for his family. All his children are very proud of him. Submitted by his Son David Medland, his Daughter Jean Irene Smith ( Nee Medland ) and his Daughter in Law Linda Joan Medland. My Mother was an eight year old child during the Blitz, living in Westdale Road, Wavertree, and to her dying day vividly remembered sitting under the stairs with her parents and older sister during raids. One night her father was away from home, firewatching at the University, when a raid obliged them to take shelter. They had only been under the stairs a short while, when they heard an almighty clatter, which her mother, my grandma, recognised as something rolling down the front slope of the roof. She went to the front door to investigate, and found an incendiary blazing on the front path. As she said later, no 'bloody German' was going to burn her out of house and home, so she got the yardbrush, and knocked it into the roadway. The blaze left the quarry tiles on the path with a beautiful irridescent shine which was permanent, and fascinated my mother. I visited the address a few years ago, in the hope of finding the tiles still in situ, but sadly they had been replaced by flagstones. My Grandfather John Edward Murphy served in the Army during WW1. He enlisted in - 5th Battalion Kings Regiment (Liverpool) Regimental number 200973. 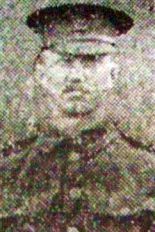 He enlisted on 9th September 1914 and passed his medical on the 10th September. I noticed his apparent age was 34 and nine months when in fact he was turned 40. His records show that he served in the Expeditionary Force in France from 28-2-15 to 21-12-16. He was awarded the 1914-1915 STAR, the British War Medal and the Victory Medal. When he was demobbed in 1919 his record shows his true age and a letter requesting the Army to confirm his rank in order to start collecting his pension. He was a Sergeant and again the record states he had been gassed and wounded. There is also a signed receipt for an advance of £2! Unfortunately I never met this brave man even though he lived until he was in his eighties and I was very young teenager at that time all due to a sad seperation from my Grandmother sometime during the war. My Grandfather originally lived in Kerr Street Everton then later on moved to Tiber Street. I have never seen a photo of him but I feel certain there must be some around. It would be fantastic to find a picture of him or his comrades in the 5th Battalion Kings Regiment. Private Peter Murphy 24/1529, Northumberland Fusiliers, 24th (Tyneside Irish) Bn. Died of wounds 02/07/1916. He lived at 29 Bostock street. Peter is buried at Heilly Station Cemetery, Mericourt-L'Abbe in France, and remembered on the war memorial at St Anthony's church, Scotland road. Private Thomas Murphy PLY/101(S) Royal Marine Light Infantry, Plymouth Bn. R.N. Div. He signed up for war as private 4670 with the King's Own Yorkshire Light Infantry, enlisting in Liverpool 7/9/14 age 33 , later transferred to Plymouth Short-Service RMLI on 16/9/14. 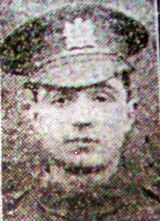 Thomas was killed in action on 25/04/1915, aged about 33, his next of kin was given as his Cousin, Mary Ellen Dignall of 47 Elias St.
Thomas is buried at Twelve Tree Copse Cemetery in Turkey, and remembered on the war memorial at St Anthony's church, Scotland road. 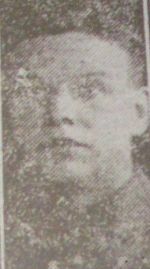 Private William Murphy 377970, Manchester Regiment, 2nd/10th Bn. Killed in action 09/10/1917. William lived with his parents at 12 Summer street, Limekiln lane, and was a former pupil at Our Lady of Reconciliation school. A letter of condolence from his commanding officer described William as " A brave and efficient soldier, whose death is deplored by officers and men R.I.P "
William is remembered at the Tyne Cot Memorial in Belgium, and on the war memorial at Our Lady of Reconciliation church, Eldon street. Private William Henry Murphy 306620, The King's (Liverpool Regiment), 1st/8th Bn. Killed in action 20/09/1917, aged 37. William was married with four children with whom he lived at 159 Burlington street. He was a member of the congregation at Our Lady of Reconciliation church. William is remembered on the Tyne Cot Memorial in Belgium, and on the war memorial at Our Lady of Reconciliation church, Eldon street. John was born on 11th June 1920 to Fermo Carlo and Christina McLachlan. At the start of WW2 John joined up as a Trooper with the 11th Hussars, Royal Armoured Corps, giving his address on joining up was 1A Queen Anne Place, Liverpool. John was sent to fight in Egypt and while he was there his father Fermo Carlo was interned in a Lancashire camp for being of Italian descent. He was classed as an Alien and an Enemy even though his own son was serving for the British Army. On 29 June 1940 John was with his regiments A Squadron as part of patrols that were observing activities at El Gubi. They came under air attack and John attempted to tow away a damaged armoured car by hooking it to the lorry that he was driving. As he tried to flee he came under further attack and was hit by shrapnel. They managed to get John away from the scene and took him to a military hospital. Sadly at 4 am on 1st July John passed away as a result of his wounds. Fermo Carlo was still in the internment camp when he recieved the news that his son had died while serving for the very Army that was holding he himself as a prisoner. John's brother Austin on returning home from basic Army training found the words ' Mussolini's Bastards ' scrawled on their tenement wall. This despite the fact that he was serving and his brother had died serving with the British Army. A cowardly act against a family who had given so much to serve their country. In 1941 my father was an RAOC driver who, after his evacuation from France in 1940, ended up at the No2 Ordnance Field Park near Retford in Nottinghamshire. During the Blitz he was sent to Liverpool on Fire Watch Keeping duties. Jim never talked about this, or any other part of his wartime service. But with a little help from his units war diaries and the internet, here's what I believe to be a fair representation of Jim's time there. In March 1941, Jim underwent training in Fire Watch-keeping duties. Jim was shown basic fire-fighting techniques including how to extinguish a Magnesium (Incendiary) Bomb using no more sophistication than a pale of water, a stirrup pump and sand. Jim was also trained in recognising how to recognise someone suffering from the effects of a bomb blast and treatment for shock. On the night of 14th March 1941, Jim took part in an exercise to assess the unit’s ability to aid a civil authority. On the 24th March 1941, Jim was informed that the units impending overseas move was delayed once again, this time to the middle of May. At the beginning of April, Jim was told his Fire Watching duties would commence sometime soon and in lieu of this was awarded another 7 days leave. On the morning of the 21st April 1941, Jim left Carlton and drove his truck in a convoy containing 258 of his fellow troops. 14 officers went in advance in staff cars and soon arriving at a transit camp in Huyton, east of Liverpool. Liverpool was an anchorage for large numbers of allied warships and a major munitions manufacturer. It was also a major port whose 11 miles of quays were capable of handling 90% of all of the war supplies being shipped across the Atlantic and as such it was vitally important to keep Liverpool working. Goering knew this and had been sending more and more bombing missions in their direction. Jim was now part of a 3 man Supplementary Fire Party (SFP) keeping watch for incendiary explosions in their area of responsibility. Magnesium (incendiary) bombs were relatively small and if caught quickly enough caused little or no damage. Each night Jim would ‘stag-on’ for up to 12 hours, in a makeshift sand bagged shelter built on the rooftops of the dockyards, railway buildings, factories and businesses of Liverpool, keeping a watchful eye out for any incendiary bombs dropping in his area. When he spotted one, Jim and his team of would dash to the bombed building and locate the incendiary bomb. Two of the team would deploy a 30ft long hose and connect it to their stirrup pump. The pump would be connected to any available water supply, which in most cases was just a bucket. Using a dustbin lid as a makeshift fire shield, Jim would approach the bomb and throw a sandbag over it, smothering the bomb. Once this was done, Jim would withdraw, whilst his 2 team mates would use the stirrup pump to spray the bomb from up to 15 feet away, cooling the bomb and rendering it safe. The team would then move onto the next bomb until they were all out, each taking turns on deploying the sand or working the stirrup pump. If Jim’s team had got there too late, those larger fires were dealt with by the men of the Auxiliary Fire Service (AFS). To help him gain access to any locked building, Jim had a fireman’s axe. Jim also had torches and a whistle to warn others of the dropping of incendiary bombs. By the beginning of May, Goering’s attentions were moving towards the Russian front and before he deployed most his forces east, he sent them towards Liverpool for one last push. Between 1st and 7th May 1941, 671 bombers of Goering’s Luftwaffe dropped 2315 high explosive bombs (870 tonnes), 119 land mines and 112,000 incendiary bombs. The AFS dealt with over 400 fires over the 3rd and 4th May 1941 and in just one week the bombing had killed 1741 people and injured 1154 more. Notwithstanding the ‘normal’ risks associated with fire fighting, the duties of a fire watch keeper were far more dangerous. Incendiary bombs were dropped by ‘pathfinder’ aircraft that ‘lit up’ areas for other bombers to aim at. This meant that if Jim team didn’t get the fires out, things could very quickly get a whole lot worse. This was exactly what happened on the 1st May 1941 when a High Explosive (HE) bomb landed in the vicinity of another SFP, killing Sgt A.H. Sampson and Cpl J.J. Kelly, both of No. 2 OFP. My Father sitting Middle/Front Row. Taken towards the end of 1944 when he had just joined the REME workshops of 23rd Armoured Brigade. This was either taken in Egypt or Greece. On the night of the 3rd May at the height of the Blitz, Jim was rocked by an enormous explosion in the region of the docklands. The ammunition ship SS Malakand, loaded with over 1000 tonnes of bombs and munitions had gone up, killing 4, destroying the docks and throwing debris over two miles away. The same night Pte G.W. Compton of No.2 OFP was injured by a HE bomb and admitted to Broadfield Hospital. By the end of the worst week of the ‘Liverpool Blitz’ two of Jims colleagues had been killed and a further four hospitalised. By the end of May, Jim had worked nights continuously for over 6 weeks. His CO was getting increasingly concerned about his men describing them as “considerably overworked with insufficient sleep”. In addition to this, he also pointed out to his superiors, that his unit was already fully mobilised and awaiting embarkation orders for immediate overseas service. His superiors took heed of his concerns and as soon as the bombing raids diminished in early June, No. 2 OFP withdrew back to Nottinghamshire. On 1st September 1941, No 2 OFP was disbanded, resulting in my father being transferred to 1st Armoured Division RAOC Workshops and sent to North Africa on 28th September 1941. My dad James was born on the 1st Feb. 1924. He was one of 4 brothers who went to fight during the second world war. Being a mum of one son I don’t know how my Granny coped having five sons away fighting in such a bloody war. When I was growing up my dad never spoke much about his time in the army he did tell us that he had been an army cook. and that he had to serve toast to the offices without crusts! It wasn’t until I was in my late teens that one of my uncles told me that my dad had had a bad war. He said he will tell you that he was a cook but before he became a cook he saw more action than any of his brothers. He went on to tell me a horrendous story of my dad sleeping on dead bodies. I asked my dad about this and he said he shouldn’t have told you that but yes it is true it happened during a battle and we couldn’t get out. My dad sadly passed away in 1995. 3 years ago I was researching my family history and decided to apply for my dads war records. During the application period I decided to go on holiday looking at brochures I had a strong urge to go to Tunisia . One evening as I sat on the hotel balcony I had what I can only say was a strong warm feeling that my dad was with me, I could even smell the pipe tobacco he smoked. When I got home his war records had arrived so settling down with a cuppa I began to read them only to be astonished to find out that my dad had served in Tunisia during his time in the war. My dad served the war years with 2ND FIELD REGIMENT RA. In the last six months of the war he became an Army Cook and joined the ARMY CATERING CORPS ATTACHED TO 25TH FIELD. World War 2 service ;- UK 4 MONTHS, NORTH AFRICA 15 MONTHS, Italy 12 MONTHS, SICILY 3 MONTHS, PALESTINE 6 MONTHS,BELGUIM ? (3 OR 7 MONTHS writing is hard to read) GERMANY 17 MONTHS. War medal 1939/45: 1939/45 STAR: ITALY STAR. Records show that he entered Theatre of Operation in North Africa 9th march 1943. and was awarded the Africa star medal in 1944. Records also show that he spent 4 stints in hospital but doesn't say what for. Took a cooks course in 1946, and was transferred to the army catering corp in 1946, attached to the 25th field reg the order was dated 19.6. 1946. His army release notes show he trained as a cook his military conduct was exemplary also says that this soldier is a very willing worker. He has shown considerable enthusiasm in learning to drive wheeled vehicles. He is honest and trustworthy. This was signed in Germany by William McIntosh major re comp. of 11. Strathern road Edinburgh 9 ,31 (kirkee) fd. bty. 25 fd. regt. r.a.
date of disinbarkment was 9th Dec 1946 at York. I am proud of my dad, his brothers Jack, George , Billy and the many men who fought to keep our country the free country it is today. Leslie Newnes was born on 15th June 1919 in Toxteth Park, Liverpool. His parents were John and Lilian ( nee Bryan ) Newnes, Lilian sadly passed away in Birkenhead in 1924. Leslie's father John remarried Nellie Turton in 1929 in Liverpool. The family lived in Gregory Way in Childwall, between Rocky Lane and Childwall Valley Road. Colin Turner, the nephew of Leslie, remembers his uncle and recalls a time that he came around to their house a little bit tipsy from the beer. He was encouraged to go home and sleep it off, but was too scared to face his father when he had been drinking. A bed was provided at Colin's house. Leslie had joined the Liverpool Scottish Territorials, based in Fraser street off London Road, Liverpool. After serving so Gallantly during WW1 the regiment had been reformed in 1920 and through their friendship they transfered to the Queen's Own Cameron Highlanders as their 2nd Territorial Battalion, remaining based in Liverpool at Fraser Street. Leslie Newnes 3rd from left, probably taken at training camp. 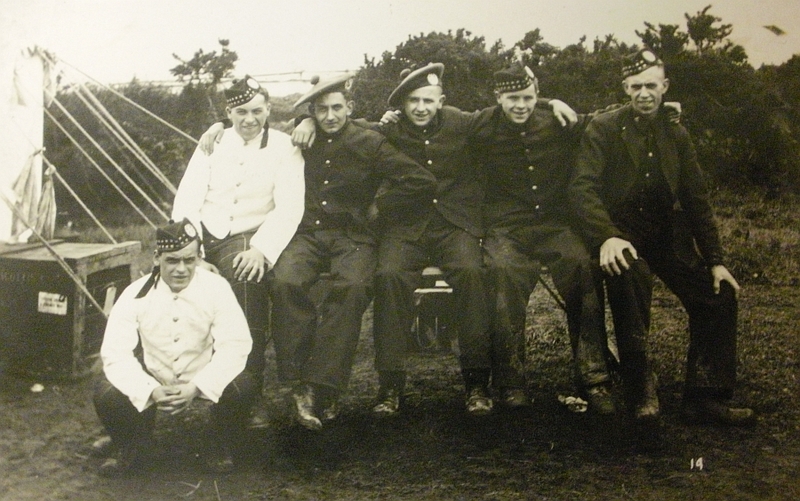 Leslie Newnes 4th from left in full Highland dress. The tents indicate they are attending training camp. 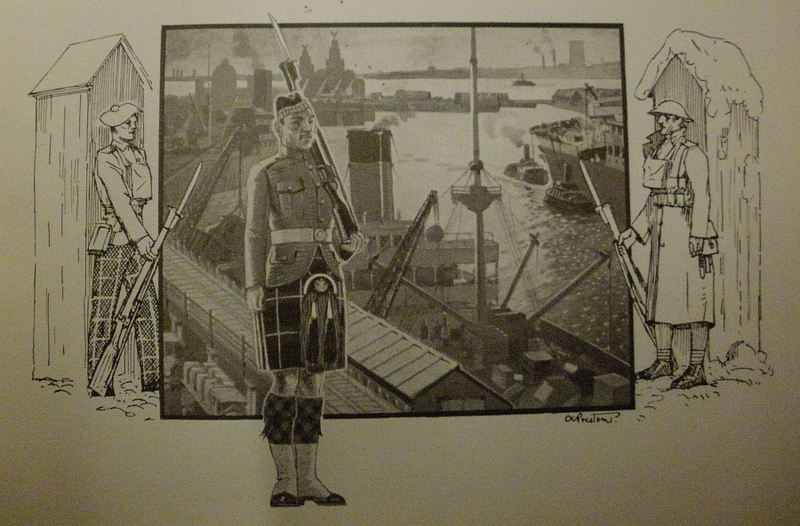 Liverpool Scottish Regiment Christmas card sent home by Leslie to his brother John in Liverpool. The date of Christmas 1939 tells us that Leslie was now away training for war and on UK service. As the war took hold Leslie would have undergone much training and saw service in various location around the UK. By 1942 he had been allocated into the Seaforth Highlanders 5th Battalion and was with them when they sailed from the UK in June 1942. The list below shows the places and battles that Leslie served in. 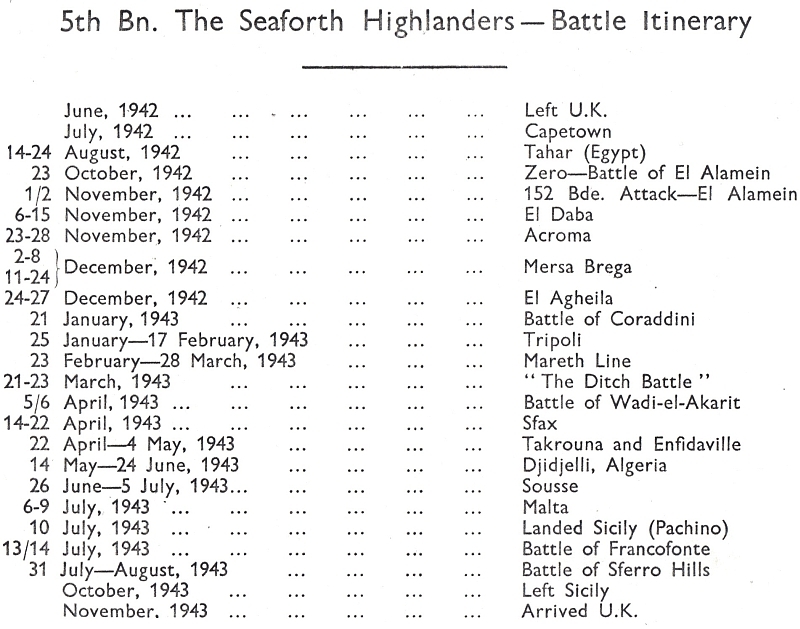 The Seaforth ighlanders and Leslie had fought across North Africa in those awful battles, on 6th July 1943 the sailed into Valletta, Malta for a short rest before sailing on to Sicily for the invasion and push into Italy. On the morning of 13th July 1943 the 5th Seaforth Highlanders were at the front of their battalion as it moved into the town of Francofonte, at first all was quiet as and although some sniping was reported by the advance party it was not enough to worry them. As they moved on they approached a tight hairpin bend in the road into the village, little did they know that they were going straight into a trap. The crack troops of the German 2nd parachute regiment had anticipated the advance and were laying in wait. As the leading Seaforths carrier moved along the hairpin road the enemy fire opened up, the carrier took a full barrage of hits from the paratroopers positioned in the nearby cemetery and all its crew were killed. As the Seaforths prepared to return the fire the Germans moved, tanks were ordered up to the hairpin and came under heavy fire and the men of the 5th Seaforths had to leave their carriers and take cover among the olive and orange trees. For the rest of the day the fighting continued with the Seaforths still taking on the enemy from within the trees, the did manage to gain and hold some advance positions, but it was tough going and costly. The following morning they were moved back into a defensive position and the British Artillery pounded Francofonte, later in the day the allies moved in and within days the town was taken. The action at Francofonte had taken it's toll on the 5th Seaforth Highlanders who lost 4 officers and 22 men during the fighting on 13th July, another 61 men were wounded. Sadly Leslie Newnes was one of those who died, he was just 24 at the time. Leslie is buried at syracuse war cemetery, Sicily. The grave of Leslie Newnes at syracuse war cemetery in Sicily. Photo courtesy of the syracuse war cemetery website. After Leslie had died his father was sent the above message informing him of where his son was buried. As you can see he was buried in the town of Francofonte where he saw the action that led to his death. After the war with the laying out of the war cemeteries Leslie was moved to syracuse war cemetery, were he now rests. Submitted by his Nephew Colin and Great Nephew's Mark and Niel. My Grandfather's Cousin Robert Arthur Newton (known as Arthur) was born in Liverpool, he lived at 73 Stormont Road in Garston. He signed up as a Private with the 2/5 Manchester Regiment , having the Service number 202474. Sadly he was killed in action on 30th March 1917, aged just 19, his parents Arthur and Ethel Newton were devastated to lose their only son. Arthur is buried in Cambrin Military Cemetery, he is remembered in our family but to my knowledge no one has visited his grave. I can not imagine how dreadful his poor parents must have felt to receive the awful news. I know they requested and received a photo of his grave, you can see the picture below. All the Nices were seafarers even my mother who worked on the I.O.M. steamers. 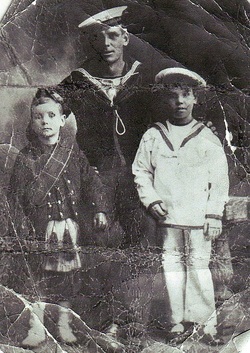 Her twin brothers Douglas and Lawrence and brother Ronald were all merchant seamen. Scanned from the Book U Boats to the Rescue, is myuncle Ron on the deck of U 507 where he was transferred from 156. Ron is standing in shorts and a life jacket. My Uncle Francis William Nice ( pictured with his brother Douglas ) was a chief cook in the Merchant Navy during WW2. In 1941 he was aboard the SS Arakaka when it sunk of Newfoundland on 23rd June. The ship was being used as a weather ship and also had 12 admiralty personnel on board. Sadly there was no survivors. Francis was aged 29. My Grandfather was a chief steward with the Merchant Navy. On 16th January 1940 he was aboard the MV Inverdargle when it hit a mine in the Bristol Channel. All hands were lost. William was aged 52. 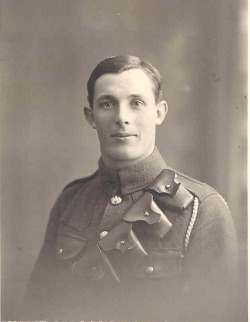 My Uncle Sapper Alfred Nightingale 77369, Royal Engineers, "L" Signal Bn. He joined up with the Army at Liverpool on 1st November 1915 ( he would die on this same date three years later ) He was 5 feet 6 3/4 inches tall, weighed 105 pounds and had a chest measurement of 35 1/2 inches. He gave his trade as a Telephone Wireman, his job probably made it easy to chose his army career with the Royal Engineers. Alfred was posted to the Stratford signal depot in Bletchley, arriving there on 5th November 1915. He left England on 2nd February 1916.His records list his wife as Anne Rossiter, who was living at 45 Arley street at the time of her marriage in 1915. It also list a son Alfred John Nightingale, born 8th July 1916 and living with his mother at 29 Portland street. The records list nothing about any leave for Alfred after he left England so he may never have seen his son, I hope I am wrong on that account. Sadly Alfred died from Influenza which he caught during an epidemic among the troops, he died just ten days before the end of the war. He is buried at Blargies Communal Cemetery Extension, France.My Grandfather John Henry Hutchinson a boer and WW1 veteran was the last family member to see 'Alf' - he walked him down Portland Steet to Lime Street and away to war. Alfred's son also called Alfred only passed away in recent years. He was a very small child when his father died - but did recall his Mother crying and also seeing a rifle in the house.